If your Chromebook displays the message “Chrome OS is missing or damaged”, you will need to recover your Chromebook. This is a quick and easy process. Read on to find out more. This message appears when Chrome OS, the operating system on your Chromebook, Chromebox or Chromebase is not working as expected. The first thing that you should try is restarting your Chromebook. Switch it off and switch it back on after 5 seconds. If the message disappears, well and good! If restarting did not fix the issue for you, here is the next step. Recovering your Chromebook using a recovery media. Recovering your Chromebook is an easy process. It will erase everything on your Chromebook, if you have everything synced using one of the many cloud storage services, you should be good. A recovery media is an SD card or a USB drive with Chrome OS for your specific Chrome device downloaded and ready for installation. To create a recovery media for your Chromebook, you will need a memory card or a USB stick with 4 GB or more space. We will format this device while creating the recovery media, so be sure to back up anything stored on the USB stick or SD card that you might want to keep. Next, you will need a computer with the Chrome browser. You can use another Chromebook, Windows PC or Mac. Install the Chromebook Recovery Utility app on this second computer. Now, on the Chromebook that you are trying to recover, look at the Chrome OS is missing or damaged message, and find the Model. On the second computer, open the Chromebook Recovery Utility app. Click Get started. The Identify your Chromebook screen appears. 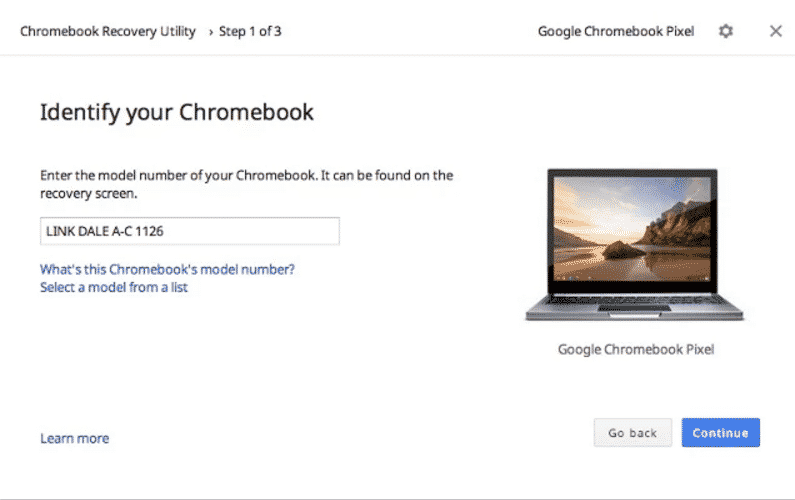 In the “Enter the model number of your Chromebook” field, start typing the model number from the Chromebook the you are recovering. It should auto-complete the Chromebook model to make it easy for you. After you enter or select the right model, click Continue. The app will now download the files required to recover your Chromebook. After completing this process, close the app and remove the SSD / USB stick from the second computer. While the broken Chromebook is displaying the Chrome OS is missed or damaged message, insert the newly created recovery media. Now follow the simple on-screen instructions to complete recovering your Chromebook. The recovery will take couple of minutes. Your Chromebook will restart after it is complete and everything should be back to normal. You can set up your Chromebook and get going!